After an unconventional childhood that ended in the tragic death of her mother and the murder of her Alaskan mobster father, Kim Rich was left on her own at the young age of fifteen to fend for herself. Ever since then, she began a nearly lifelong pursuit in chasing what most others had--a normal life. Rich tugs at your heartstrings as you follow her journey toward normalcy, from her teen years, freshly orphaned, through her high school years spent couch-surfing at local families' homes, then through her college years, a failed first marriage, and a rising career as a journalist. Through frank and down-to-earth storytelling, Rich also tells of her grandfather's kidnapping, a frightening health crisis, and a six-year attempt to have children. Picking up right where her first memoir, Johnny's Girl, left off, A Normal Life recounts the author's vivid story of being an ordinary girl faced with extraordinary circumstances--at seemingly every turn in life--with grace, humility, and wit. 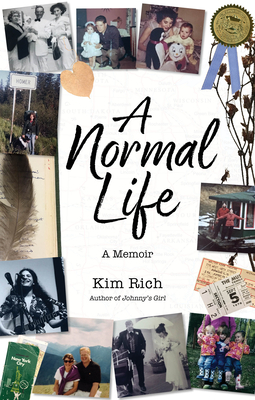 Kim M. Rich is the author of Johnny's Girl the nationally acclaimed memoir of growing up in Alaska's underworld as the only child of gambler John F. "Johnny" Rich and exotic dancer, Frances "Ginger" Rich. Johnny's Girl chronicles Alaska's mean streets and her parent's tragic lives cut short. Rich's father was murdered when she was 15; her mother had died a year later in a psychiatric institute. The book was reviewed and featured by, among others, the New York Times, the Los Angeles Times, CNN, NPR, Glamour magazine and Entertainment Weekly. The book was adapted into a Hallmark film starring Treat Williams which aired on ABC and is still in syndication. Rich's undergraduate studies were in Journalism. She began her career with the Pulitzer-Prize winning Anchorage Daily News. She possesses an M.F.A. in Nonfiction Writing from Columbia University. She continues to write and teach college. She currently lives in Lafayette, LA, with her husband and three teen daughters.